When you’re designing an airplane that could one day be the first to fly on Mars, the answer cannot be found in the back of the book. That’s one of many conclusions groups of students in two NASA-funded programs at NASA Armstrong Flight Research Center in California realized last summer. They worked on the Preliminary Research Aerodynamic Design to Land on Mars, or Prandtl-m aircraft. If the project is ultimately successful, it could collect and transmit valuable information about future landing sites for human exploration. Their task was to use the skills learned in school and apply those to a research challenge. 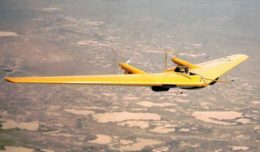 The two programs included the NASA Flight Scholars, which focuses on giving community college students an early opportunity to perform research and the Education Small Unmanned Aerial Systems Center of Excellence, which provides college students an opportunity to work on NASA UAS projects. Both are funded mostly under the Minority University Research and Education Program that highlights minority-serving institutions. The students started with a boomerang-shaped aircraft constructed of carbon fiber and conducted researched by flying it down the halls, in a conference room and then in an aircraft hangar. Flights progressed when students agreed on a launch system to obtain consistent results. Those flights allowed a look at the aircraft’s aerodynamics before moving on to more complex tests and higher altitudes. Tests didn’t always turn out as expected, but setbacks didn’t dampen the students’ enthusiasm. Michael Kloesel, a California State University at San Bernardino chemistry student, was excited. Raziq Noorali, who studies physics at College of the Desert in Palm Desert, Calif., said the internship showed him that different skills and viewpoints are needed to solve aspects of the Prandtl-m work. Sipanah Arutyunyan, who studies aerospace engineering at California State Polytechnic University in Pomona, expanded on that idea. Students also worked on teams to build a case for convincing others their solution is the best. “The presentations have to be good and you have to have skills in speaking and presenting ideas and be convincing to go through with a plan,” said Eduardo Uribe-Saldana, a biomedical engineering student at Antelope Valley College in Lancaster, Calif.
Hussein Nasr, an aerospace engineering student at California State Polytechnic University, said the road to success is long. For example, Arutyunyan explained one of the first boomerang-shaped Prandtl-m aircraft developed a crack. During a test, it crashed and the fatigue of multiple flight tests caused it to fail. The team was frustrated. “It means we have to go back to the drawing board,” Uribe-Saldana added. That’s exactly what the students did. A series of flight tests led them and their mentors to the conclusion that the aircraft’s chord, the distance between the leading edge and trailing edge of the wing, needed enhancement to gain more lift and stability. The changes led to a more delta-wing shape with a twist, explained Joshua Tanon, who is studying aerospace engineering at the University of Michigan in Ann Arbor. The basic aerodynamic principles were sound, but a new shape and materials — it was made of balsa wood sandwiched between two pieces of fiberglass — needed a new launch method. It was determined a radio-controlled aircraft would take the research ship to the required altitude and release it. The results — the aircraft crashed. Investigation of the incident showed a failed servo to be the cause. The students had to wait for another day to see if their aircraft would fly and it did. After launch it was controllable in flight. In a few months, a new design is expected to take flight based on the past test flights. David Berger, a key driver of creating the experience for students, said it was a success. Berger said the pilot program was intended to give college professors a research project to work through with their students and then travel to NASA Armstrong for the research flights to see the results. Khalid Rubayi, an electronics instructor at Victor Valley College in Victorville, Calif., said his task is to put the students on a path, guide them and nudge them back on the path if they digress. The project had an approach, project documentation, deadlines, readiness reviews, safety plan approvals and a manual of procedures. “They also learned teamwork, communication and how to integrate areas,” Rubayi said. There were other lessons too. “They gained an understanding that you can’t have all of the answers and resources,” Berger added. There’s a lot of work to do before a Prandtl-m might be scheduled for a flight on Mars, but students developed the foundation other groups of students can use to move the idea along. Maybe one day the student research will lead to the first aircraft on Mars.